Those 1TB/s is just awesome, for 1440p & 4k. Can't wait for HH's review!! As a few others mentioned If possible to check undervolting performace too, that would be great! Surprised we havent seen the MI50 tested or reviewed on the web yet (released last November?). As that may have given us an indication of some sort as to the thermals or other performance characteristics vs the R VII. edit: the MI50 is passively cooled, no fans. Guess gaming workloads are far more intensive than pro applications. Think about this 16GB HBM2 card and the future Navi based cards with Freesync 2 HDR 10(and the future HDR 12) playing Cyberpunk 2077 (maybe will be on DX12),GTA VIce or Red Dead Redemption 2 on PC on glorious 4K+ HDR 10 monitor. More pressure on devs to have HDR 10 implemented in their games will make gamers happy. 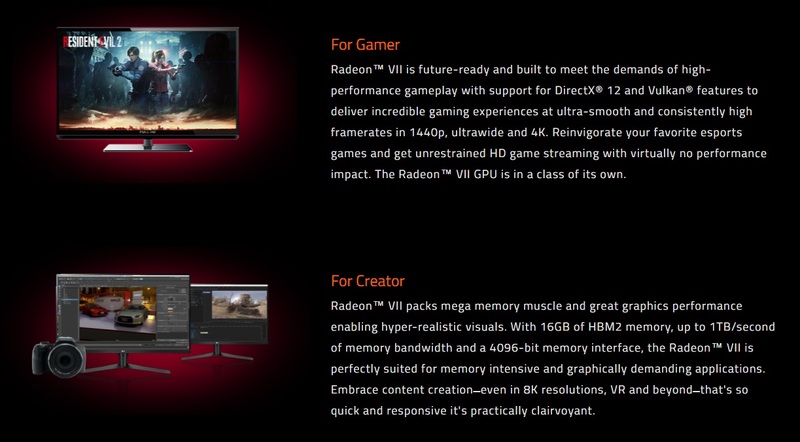 If Radeon VII will be on par with RTX 2080 after 6 months of optimized driver then everyone will be happy. One thing I noticed is the radeon badging on the side covers exhaust area for the cooler. Hope that doesn't effect anything. Overall great looking card. Steve from gamers nexus mentioned that and how it wont be abstracting airflow. He also said how nvidia is doing the same. That PCB has 'workstation' written all over it. I wonder if another brand will release a NANO version? Lots of empty space on the that PCB but otherwise looking forward to Hilbert's review. Hilbert are you allowed to comment on the double precision 64 bit compute speed? Some say its full M150 speed and other say it is limited to 1/4 or 1/8 speed, to not compete with the M150. It's 1:8 - AMD confirmed it to Ryan Smith. It's a gaming targeted card, so obviously they have limited fp64 perf not to canabilize the Pro range. By how much you'll be able to read in the review. Well what do you know, look at what Denial wrote there. They appear to be specifically mentioning the graphics creator side of things for these. Can't wait for review, woot! !